Occasionally, we publish articles on topics that don’t have a lot to do with mounts. Ironically, some of the them have become quite popular. For instance, our article called How to Lower Your AT&T Wireless Monthly Bill gets more hits than many of our mount articles. So today, we’re going to show how to get free home phone service. That’s zero as in free. It’s always interesting to see what old technology morphs into. A home phone is an old concept that has fed into what is today’s smartphone. It’s the same concept. Call somebody and speak with them using a phone. Sure the phones are different, but the concept is the same. However, how the call is made is different. While many households still use the copper wire feeding into their home, many have abandoned it for cellular or voice over IP. Both of these technologies are what’s used to get free home phone service. Let’s start our quest to free home phone service. We’re going to take advantage of a free service called Google Voice. This service provides a free and feature rich home phone experience. A few of the more notable features includes voicemail, call routing, simultaneous ring to multiple phone numbers, call screening and conference calling. Most important though, it gives you a local phone number. Google Voice is tied into your Gmail account. Once you sign up for Google Voice and answer a few questions, you will be provided with a list of local phone numbers from which you will choose a unique phone number. This number is what people will use to call your home phone. Now all you need to do is connect your home phone to your home router. It’s easier than it sounds. See the device in the photo that accompanies this article? It’s called an Obihai 200. This small device goes between your home router and cordless phone base. The main purpose is to turn your internet’s data into voice data. There are several different companies that offer these voice over IP adapters. Most have heard of Magic Jack and Ooma. It’s the same concept. The big difference is the ongoing cost. Magic Jack and Ooma charges a reoccurring fee. I the case of Ooma, a monthly charge for taxes and fees adds up to roughly $60 annually for basic service. That number will vary depending upon your location. Start adding in the fees for some of the free features of Google Voice and you can tack on an additional $100 per year. Magic Jack has similar, but a bit lower, fee schedule. Google Voice is completely free. 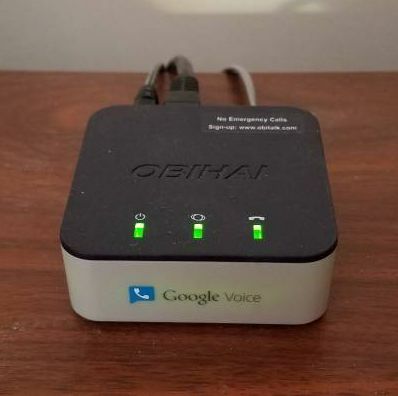 The Obihai 200 is made for use with many different Voice Over IP providers however they made integration with Google Voice a simple quick process. Instructions on how to do that are included in the box with the Obihai 200. Sure, like anything in life, there is always a catch. The Obihai 200 isn’t a free device. However once you purchase it, there are no annual fees for continued use (at least not as of the publishing date of this article). Google Voice has been free since it started and continues to be so as of today. Bottom line is the Obihai 200 and Google Voice provide home phone service without a reoccurring monthly charge. The second way to get free home phone service is to link your cell phone with a home phone system. This can be done a Bluetooth enabled cordless phone system. You would need to purchase a new home phone system if you don’t already have one that is Bluetooth enabled. The drawback to this method is, obviously, you need to have a cell phone and the minutes used on your home phone will add to your cellular bill. If you have an unlimited plan, no concern. The second drawback is the Bluetooth distance limitations of about 30 feet from the base so if you roam beyond that range, it won’t connect.